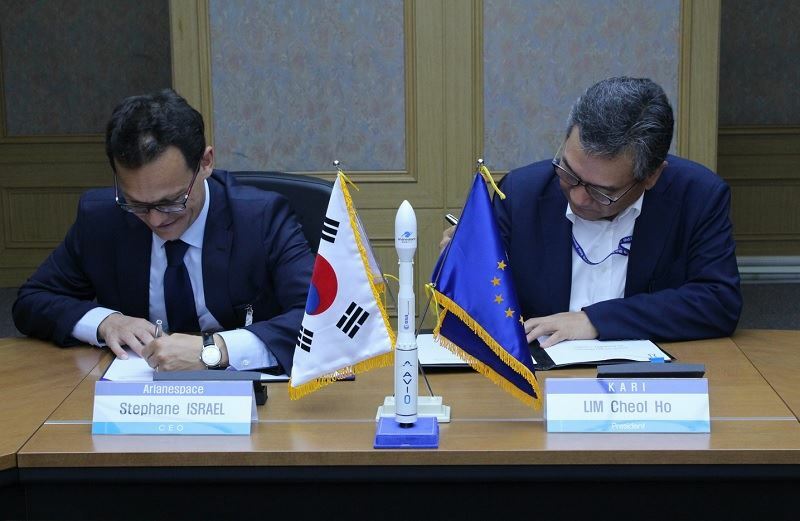 South Korea’s space agency, the Korea Aerospace Research Institute (KARI), will launch earth observation satellite KOMPSAT-7 on Arianespace’s Vega C rocket in 2021. KOMPSAT-7 will be the fourth KARI satellite – as well as the ninth Korean satellite – to be orbited by Arianespace to date. Currently, Arianespace is due to launch GEO-KOMPSAT-2A & 2B, two of KARI’s geostationary earth observation satellites, aboard its Ariane-5. This will be Arianespace’s first time orbiting a satellite from the KOMPSAT series, which comprises five previously-launched satellites (KOMPSAT -1, -2, -3, -3A, -5) and two planned satellites (KOMPSAT -6, -7). So far, most KOMPSAT satellites have been launched by Russia/Ukraine, with KOMPSAT 3A and KOMPSAT 5 using the now-defunct Dnepr, and KOMPSAT 2 using Russia’s Rokot. Its next launch, KOMPSAT-6, is slated to take place in 2020 using Russia’s Angara 1.2, which is currently under development. KOMPSAT-7, whose designed is based on KOMPSAT-3, will weigh approximately 2,000 kg at launch and will be placed in a Sun Synchronous Orbit (SSO). The satellite will be equipped with the high resolution camera named AEISS-HR (Advanced Earth Imaging Sensor System with High Resolution), which possesses 0.3m or less resolution, and is an upgraded version of KOMPSAT-3’s AEISS. A few days ago, Arianespace signed another contract for its Vega-C – Thailand’s THEOS-2, a very-high-resolution Earth observation optical satellite delivering 0.5-meter ground resolution imagery, and will be based on Airbus’ AstroBus-S platform.